In this week’s Black & White Challenge, Cee is asking us to focus on subjects that are more than fifty years old. I’m pretty confident, then, that my home town of Much Wenlock more than fits the bill. As a settlement, it has been continuously occupied for the last thousand years. 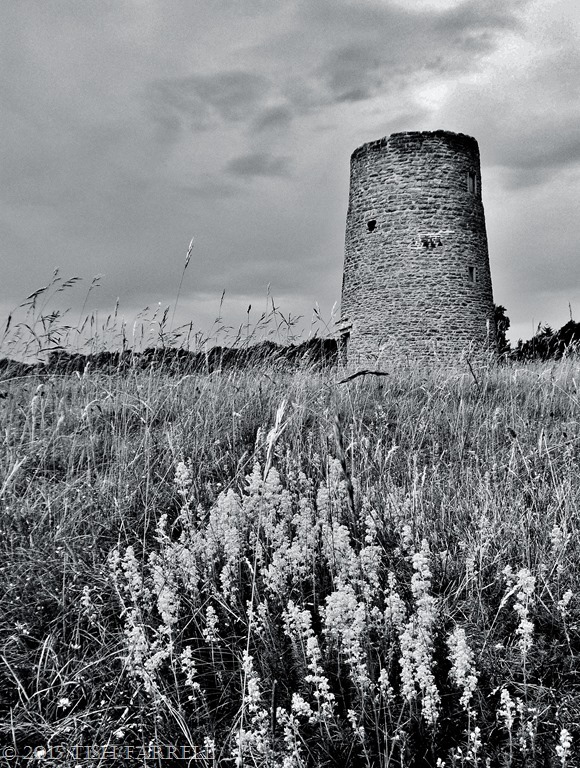 The town windmill (seen above) is not quite that old. I’ve begun with it because it is the oldest structure near my house. It was busy grinding corn from around 1655. Then a lightning bolt struck it in 1850, and it has remained sail-less ever since – either a pity or not, depending on your views on historic conservation. On the other hand, I perhaps needn’t have gone as far as the windmill. You might say my own house is something of a minor monument age-wise, much like its inhabitants (?). It’s original half dates from the 1830s. In the living room there’s a massive inglenook fireplace complete with bread oven that defies my attempts to photograph it well, so you’ll have to imagine it. Instead I’ll take you on a walk down Sheinton Street to see a few of the other sights. 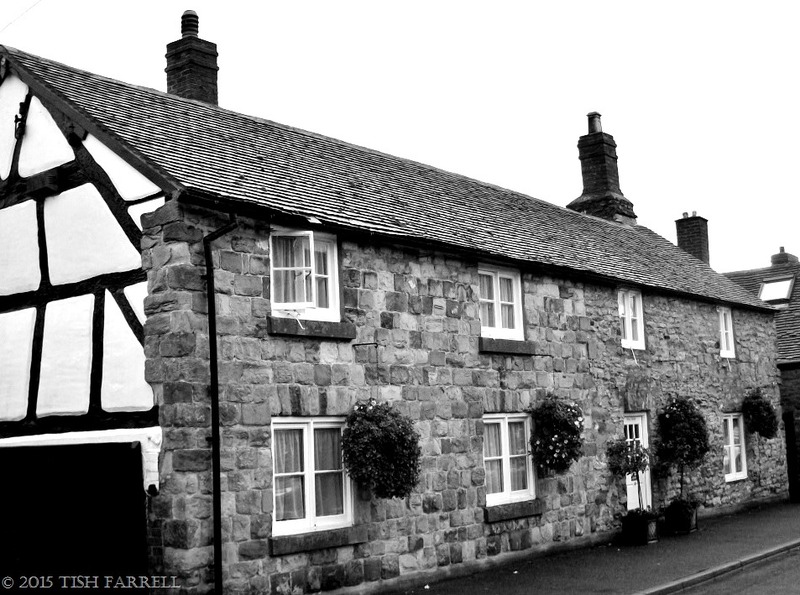 Heading into town, there are here-and-there signs of the medieval origins of many of the cottages, their timber frames concealed or disguised by brick and stone exteriors that have been added in more recent centuries. Most of these cottages would have once housed artisans, their workshops opening directly onto the street to catch the eye of potential customers. The living quarters, and gardens would have been behind the workshops. In fact, the layout of long medieval burgage plots behind these Sheinton Street properties, and now pretty gardens, are still visible from the field path. Today, Much Wenlock is a sleepy sort of place, much gentrified, and up-marketed. But step back a couple of hundred years, and much of it would have been grimy and industrial. Not only was there quarrying and limestone burning going on around the town, but within it were once the smoking kilns of the clay tobacco pipe manufacturers, stinking pits for the curing and tanning of hides for leather working, horses and carts churning up the dirt. Brewing was also a big local trade, as were slaughtering, pewtering, smithing, weaving, and hat and shoe making. The unmade streets were alive with taverns to wet the throats of dusty quarrymen, and the final touch, ambiance-wise, would have been provided by the malodourous effluvia of the Schetbroke, an open sewer of a stream which ran through the town (but now happily culverted). I don’t know the particular history of this rather grand cottage seen above, but it’s a good example of a later stone frontage added to a much older building. Most of the town’s stonework has in fact been recycled from its medieval priory, dissolved by Henry VIII in 1540. In amongst the antiquity we can also find more recent buildings. 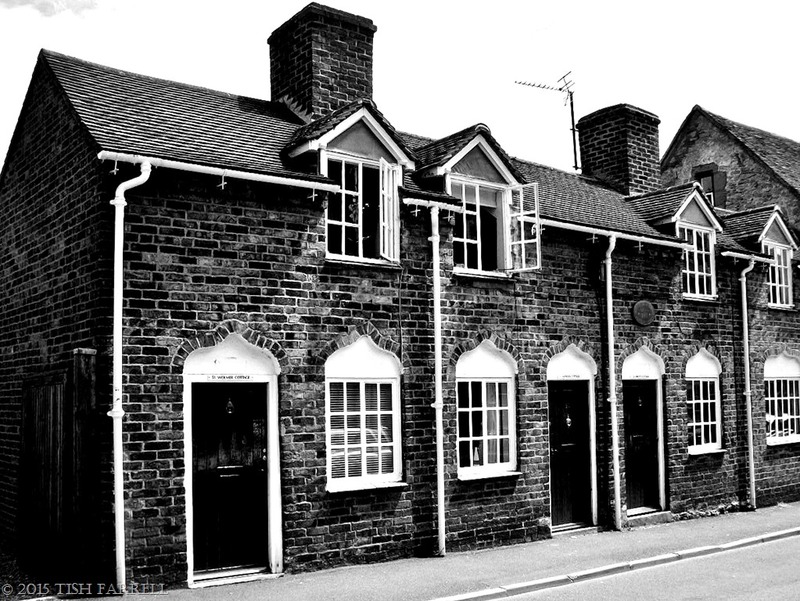 For instance, in the space between medieval neighbours is this little set of picturesque alms houses built in 1810. They are known as Wolmer’s Alms Houses, a charity founded in the town in 1485. They are still operated on a charitable basis for the elderly. I love the brick ogival arches over the doors and windows. At the end of Sheinton Street is Brookhouse Farm. It is now a residential enclave of smart barn conversions, but until fairly recently was one of the last surviving examples of England’s town farms. I can still remember it in the 1990s as a very rustic farmyard with cattle in the barns. 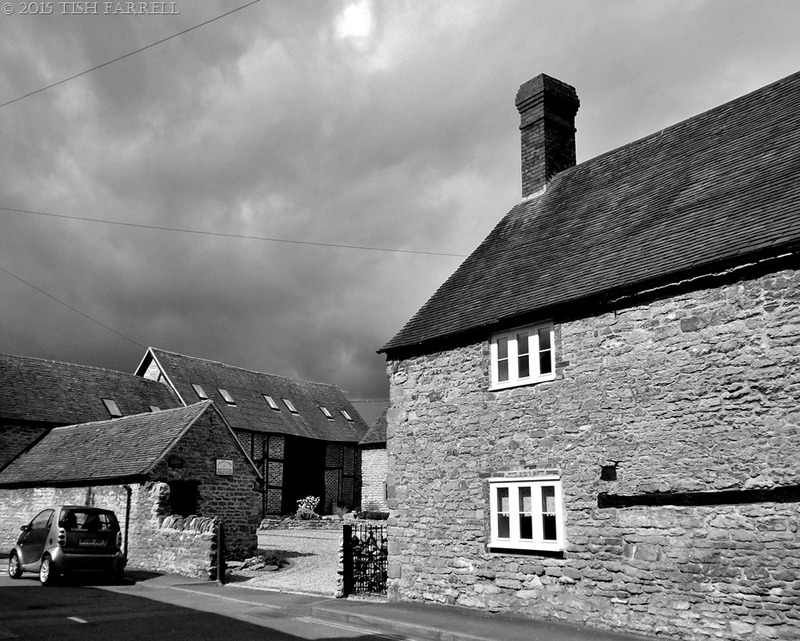 The farmhouse in the foreground was stone-clad in the early 1700s, and is one of several Much Wenlock houses with a medieval hall concealed within it. You might call this the Chinese Box school of architecture. …so named after the unsavoury pursuit of bull-baiting that went on here until the early 1800s. 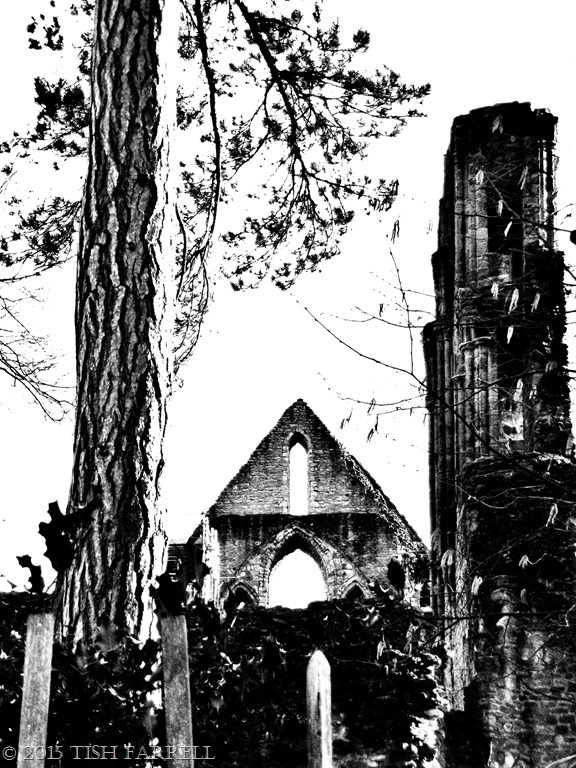 By then the timber-framed building had stood for some 200 years, while Holy Trinity Church, seen behind and in the next photo, stands on the site the Saxon women’s church of St Milburga’s Abbey, founded in c.680 AD as a religious house for both nuns and monks. The oldest part of the present church is the nave which dates from 1150. Other parts were constructed in the 14th and 15th centuries. 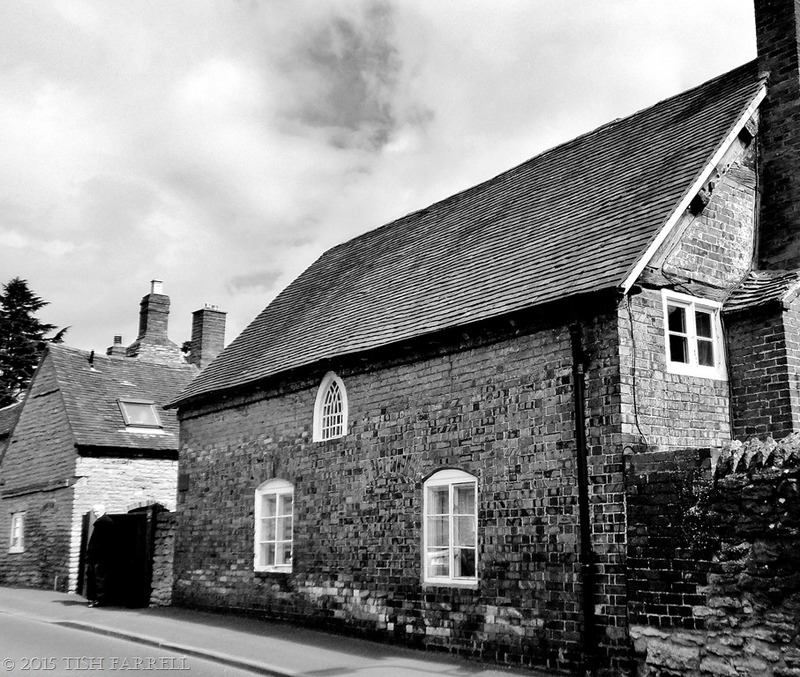 During monastic times, Much Wenlock was ruled by the Prior under ecclesiastical law. After the dissolution in 1540 a new civil courthouse had to be built. It stands just across the Church Green, and marks the centre of the town. These days the ground floor is the venue for our various markets, while upstairs houses the original law court (now a gallery) and the council chamber which is still used for all Town Council meetings, and has to be one of the most uncomfortable, if august, venues in the whole town. And now we’ll double back on ourselves. Please head under the arch (look out for the man with a camera) and cut across the Church Green for our last stop on this tour – a quick look at Much Wenlock Priory. This is the view from the lane, where the site’s perimeter is shaded by soaring Corsican Pines. We’ll need more time to make it worthwhile buying a ticket to go inside, so I’ll leave you with a photo from one of my earlier visits: a close-up of the monks’ lavabo where they used to wash before entering the refectory to take their meals. 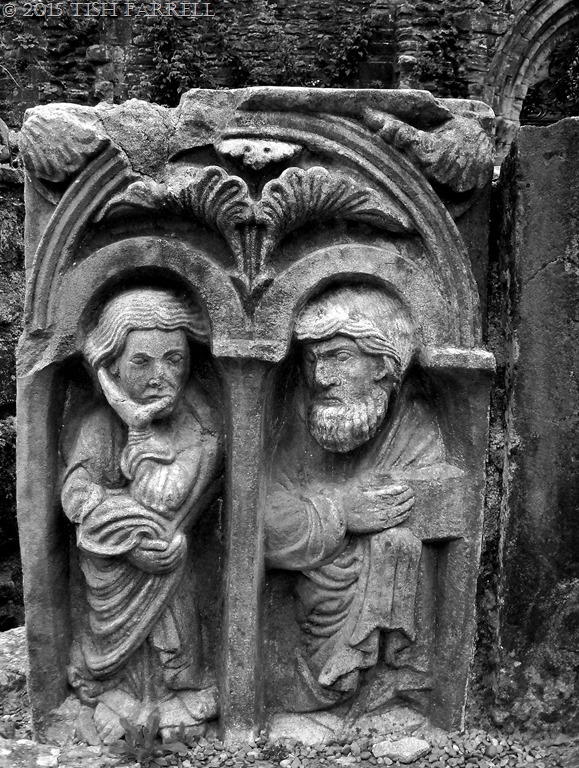 The carved panel dates from c.1180, which is odd, actually. I could swear one of the saints is on his cell phone. Not so much religious texts, as a direct call to the Almighty? In Part 2 I’ll take you on a black and white stroll up the High Street. 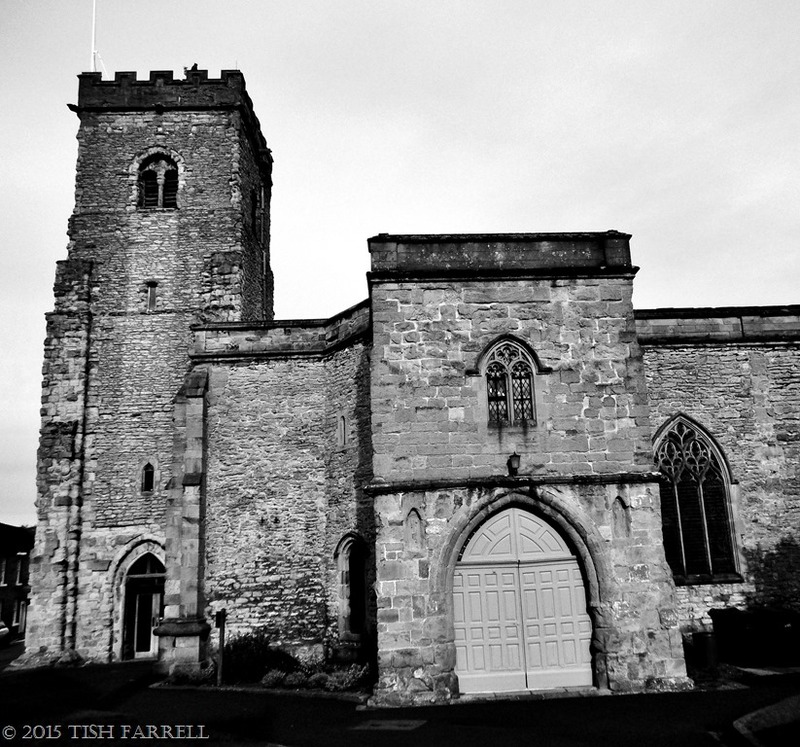 Posted on July 18, 2015 July 19, 2015 by Tish Farrell	This entry was posted in Architectural History, Humour and tagged Cee's Black & White Photo Challenge, Much Wenlock, Much Wenlock Priory, Shropshire, Tish Farrell Writer, Wenlock Edge. Bookmark the permalink. How interesting and what fabulous photos. Some subjects are made to photographed in B&W. Wenlock looks like an intriguing place to live (and photograph). If hadn’t been for Cee’s challenge, I wouldn’t have really thought about the town as a whole being an interesting subject for B & W. I’d taken the individual shots of course. It’s always fascinating to me how removing colour can change your perceptions of the subject. Are there modern housing estates on the edge of the town Tish? Enjoyed both the photos and the very interesting tour of your town. It looks like a very pleasant environment, and I just hope that there are a few small farms left there, Thanks very much. I would very much like to see that bread oven that defies photography. Perhaps you could do a series, and then organize the photos the way a puzzle is put together. I’m not really sure what the problem is, but if you speak of all of the settings, it could be that what you need is the use of the tripod. Ah yes, the tripod. I must get it out again. 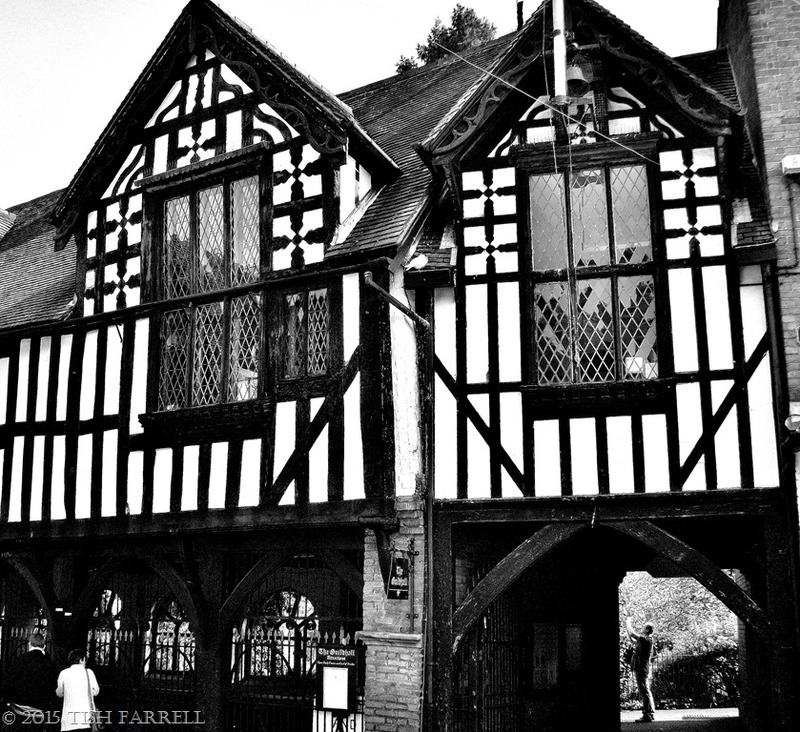 Every time you post photos of Much Wenlock I feel the urge to come and see it myself. 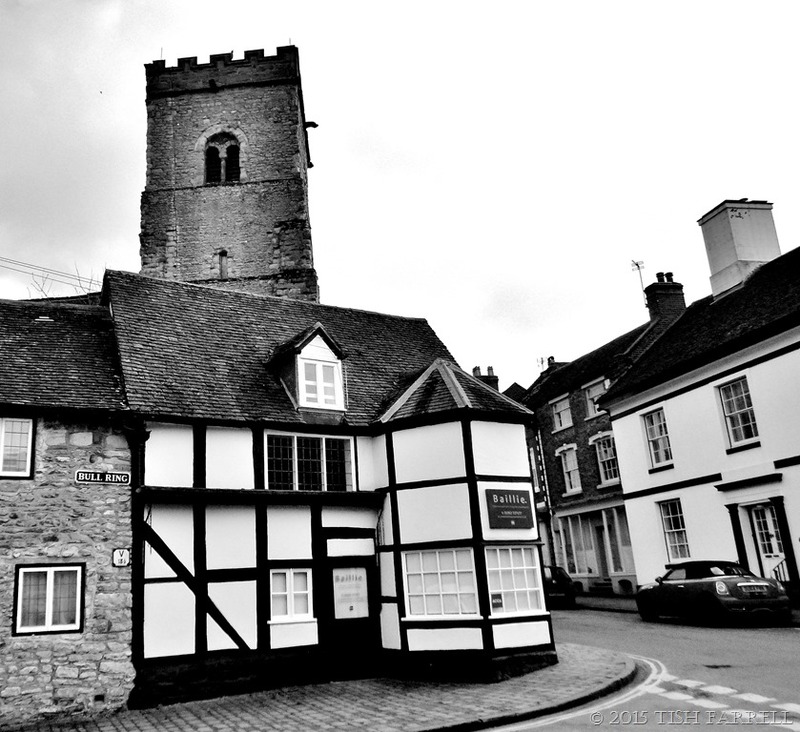 This post is a wonderful tour of the town and the black and white conversions suit it well. Many thanks, Cee. And for being such a fine hostess for all these interesting challenges. I like architecture in black and white, but I still prefer almost all landscape in color unless there is some compositional element so strong that black and white brings it out. Your little town is beautiful in every way. Black, white, and rainbow. I agree with you about landscape shots, although wintery ones can be quite dramatic in b & w..
Beautiful–I like them all, but the second one, with the rose, is a favorite. I wish I could see the world visually in a way that favors capture. You’ve got a wonderful talent. That’s very kind of you to say so. Yes and I’m no help, all these chimes. What a huge change there has been in your town from the days gone by of grimy and industrial to the present day gentrified and charming. It now looks an interesting and very photogenic place to live. 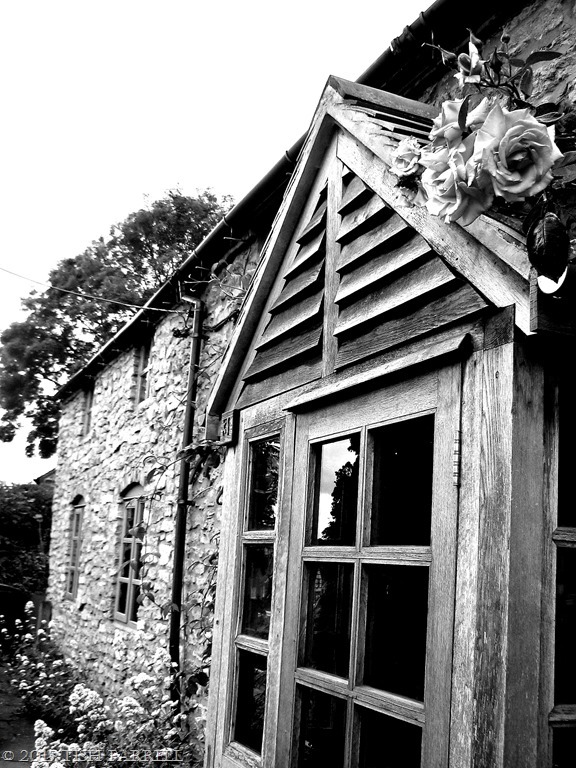 The B&W gives it a very old and mellow feel totally suited to the style of buildings. I loved your descriptive tour around and I do believe I spotted an electric car outside the farm house, the old and the new. I wonder if that saint got through???? 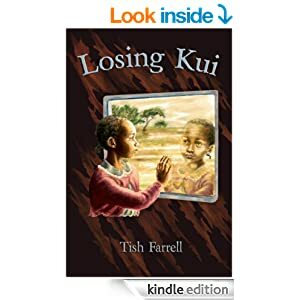 Stunning photo’s of your town, Tish!! Black-and-white photography is such a powerful medium. There’s just something special about the way it captures the essence of its subjects. Such town history, not to mention great fodder for storytelling! And I LOVE that your home is centuries-old. Imagine the tales it could tell! Don’t let that fireplace get the better of you. 😉 Would love to see what it looks like. Thank you for visiting Much Wenlock, Nadine. I will have to have another go at the fireplace. Wow, lovely town, well suited to be photographed in black and white I think. Yes, I was pleased to see how well the town looks in b & w. Thanks for commenting. I am just enthralled by the history – here “old” is 100 and we can be impressed with less than that 😉 The area of eastern Ontario in which I live was settled early and there is some history here … but not like Britain. We will be visiting Scotland and Ireland this fall and I am looking forward to the history, places I will no doubt look up once we return – our itinerary is loose and while we are doing some research beforehand we don’t know just what we will see or where our meandering drives will take us. Meandering is good, Lynne. I quite like finding out where I’ve been later. That way you can add to the first impact/ impressions, rather than missing them by being bogged down by too much research. You will have a great trip. Btw I found the settler history of southern Ontario when were there a few years ago, quite fascinating. Graham spent some of his formative years in London, and he took me back there for a visit. Another delicious post, Tish. All those stone building, and especially your home. What took you to Much Wenlock? An inspiration for a woman of your interests and aesthetic. I love the lane view and the lavabo and the barn and the sky behind it and the way you locate it all in the stream of history. Looking forward to Part 2. I am glad we get to view the town without the distraction of all those former less attractive sights and smells. Oldest city in US St Augustine, Florida 1565. Few know the Spaniards had over 400 towns and missions in what became the SW quadrant of the US before first permanent English settlement. What a beautiful town. I would love to visit this place. Those stones carved houses, those black & white windows. I have similar style villages near to my place and I just love walking around there. So I’ve got to part 1 of your town and like is much. It seems to be in a beautiful area of England but I have never visited it, maybe something to keep in mind for future travels.